Luther College received a A.
U.S. News & World Report's ranking of 89 out of 178 of National Liberal Arts was a major contributor to this grade. Located in the small northeast Iowa town of Decorah, Luther College educates about 2500 students in the liberal arts and maintains a solid affiliation to the Evangelical Lutheran Church. In their free time, students can canoe or fish the nearby Upper Iowa River or go spelunking in one of the area's caves. What is a typical Luther College student like? Describe the type of person that should attend Luther College. A typical Luther College student is smart (some are very smart), self-assured, and self-reliant. The student is independent but likes to socialize. What are the top 3 reasons someone should attend Luther College? What was a typical Luther College student like in high school? Describe the type of person that should attend Luther College. 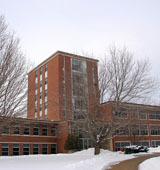 Located in the small northeast Iowa town of Decorah, Luther College is an undergraduate liberal arts institution of about 2,500 students. The college is affiliated with the Evangelical Lutheran Church in America. Founded in 1861 by Norwegian immigrants, Luther offers more than 60 majors and preprofessional and certificate programs leading to the bachelor of arts degree. Its mission statement emphasizes faith, leadership, and community service. Luther College provides equal opportunity for all qualified persons in its educational programs and activities. What are the top 3 things that students do for fun at Luther College? Attend and participate in the classes they like; participate in intramural sports, and get together with friends mostly on weekends. 18% of students received Pell Grants, which are provided by the U.S. government to students from middle and lower income families. It gives you an idea of a school’s socio-economic diversity. Campus housing is available for undergraduates. Housing deposit is not refunded if student does not enroll.. Freshman allowed to have car. No pets. 85% of students live on-campus. 1% of male students live in fraternities. 2% of female students live in sororities. A program that focuses on one or more of the extinct Semitic and/or Non-Semitic languages spoken in the ancient Near East, including those used to write historical Jewish and Christian religious texts. These languages include, but are not limited to, Egyptian/Coptic, Sumerian, Akkadian, Babylonian, Assyrian, Aramaic, Cannanite, Phonecian, Samarian, Ugaritic, Syriac, Mandean, Hattic, Elamite, Hurrian, Hittite, Urartian, Lydian, Luwian, Lycian, Palaic, Sabaean/South Arabian, and other associated languages. Includes instruction in philology, epigraphy, papyrology, numismatics, and textual studies. A program that focuses on one or more of the languages, literatures, and linguistics of the peoples of Scandinavia and associated Northern European island groups. Programs may involve multiple languages and language families, not be specific as to the name of the language(s) studied, or be otherwise undifferentiated. A program with a general synthesis of mathematics and statistics or a specialization which draws from mathematics and statistics. Includes instruction in calculus, linear algebra, numerical analysis and partial differential equations, discrete mathematics, probability theory, statistics, computing, and other related topics. 59% of students graduated in the top quarter of their class. 32% of students graduated in the top tenth of their class. The average student pays $24,873 for tuition, fees, and other expenses, after grants and scholarships. Total stated tuition is $37,330, in-state and on-campus, before financial aid. Learn more about financial aid at http://finaid.luther.edu/. Estimate the net price for you at http://www.luther.edu/financialaid/prospective/netpricecalculator/. 66% of students graduated on time. 76% of students graduated in six years. 87% of full time students continued studying at this school after freshman year. The typical (median) early career salary of Luther College graduates is $43,700, according to Payscale. Luther College participates in the NCAA Division III for college athletics. Want more info about Luther College? Get free advice from education experts and Noodle community members.